NES Snake Rattle N Roll (USA) in 10:17.17 by Devindotcom. 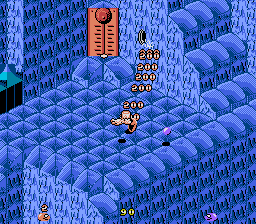 Snake Rattle 'n Roll is mostly about collecting the "nibble bibbles" or something like that, but the biggest part of the game is the tricky maneuvers required to complete the big mountain levels. This 10 minute movie is quite an acrobacy. No warps are used. The movie does not include the ending demo because Famtasia issued a "unrecognized opcode" warning when the game was completed. The movie could probably be improved by a bit by luring out some better luck, but it's a somewhat good first published version (second try).